It’s fitting that the Hollywood Sign, the worldwide symbol of the entertainment industry, was conceived as an outdoor ad campaign for a suburban housing development called “Hollywoodland.” After all, despite the high profile of the film biz, real estate has always been Hollywood’s primary economic driver. Although the Sign’s appearance and purpose have evolved over the years, its basic aspirational message remains the same: This is a place where magic is possible, where dreams can come true. Come explore the fascinating past and present of this icon, town, industry, and idea in our detailed History of the Sign. Imagine a time when the only stars in Hollywood were found in the crystal- clear night skies arching over rolling hills. This was the setting for the area’s native people, the Gabrielinos. All was quiet until 1907, when bad weather drove a small Chicago film company westward to complete a shoot. The first real studio, Nestor Film Company, soon followed from New Jersey, cranking out three pictures a week – one ‘western,’ one ‘eastern,’ and one comedy – for a grand total of $1,200. By 1915, America was officially film crazed, and Hollywood was shaping into the glamorous, sometimes surreal landscape we’ve come to know and love. Hopeful actors and actresses filled the streets, dazzled by a new American dream: film stardom. 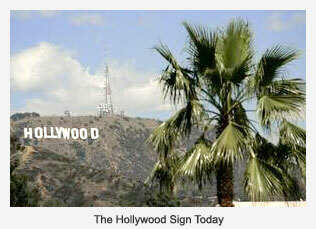 Hollywood has always been a place where visionaries harness technology for entertainment and communications. Mount Lee, the home of the Sign, bears the name of a famous entrepreneur who made this ridge in Griffith Park into one of the most important historical sites in television history. The advent of synchronized sound sent the picture industry reeling, as the big studios frantically re-tooled and acting careers were ruined and made overnight. When Japan attacked Pearl Harbor in 1941, Hollywood mobilized to become a full-time war industry. Studio trucks transported troops instead of movie sets. Stars like Clark Gable, Jimmy Stewart and Victor Mature quickly enlisted. The film industry’s high profile made it vulnerable in the postwar climate of anti-liberal hysteria. By the early 50’s, 400 actors, writers, directors and producers were blacklisted, and paranoia prevailed. During the 1960s, Hollywood suffered through a mass exodus of residents to the suburban San Fernando Valley. Even more distressing was the flight of film power centers to the Valley and other less cramped environs. By 1970, Paramount was the only studio left in town. In 2003, the Sign celebrated its 80th anniversary at a gala celebration hosted by the late movie musical legend Esther Williams (at the time, she was another remarkably preserved octogenarian). The ‘birthday party’ was held during the opening ceremonies for the AFIFest – which was sponsored in part by the Trust. In 2010, thirty-two years after the Sign was rebuilt, the Sign’s #1 fan, Hugh Hefner, presented the Hollywood Sign Trust with the closing gift to ‘Save the Peak,’ capping efforts to raise funds to purchase and protect the 138 endangered acres behind the Hollywood Sign. In preparation for the 90th anniversary in 2013, the Hollywood Sign Trust and Sherwin Williams teamed up to give the Sign a more complete make-over. Hollywood’s civic restoration, which began in the 1970’s, picked up steam in the ensuing decades, fueled by a growing reverence for what the industry had come to represent worldwide. The Sign has always served as a barometer for the community; and as Hollywood re-blossomed, so too did the Sign, which benefited from a range of new preservation efforts.